NetEnt has whipped up a rock frenzy with the announcement that the PAF Casino Team have prevailed in its one-time-only competition for a guitar signed by Guns N’ Roses legends Slash and Axl Rose. 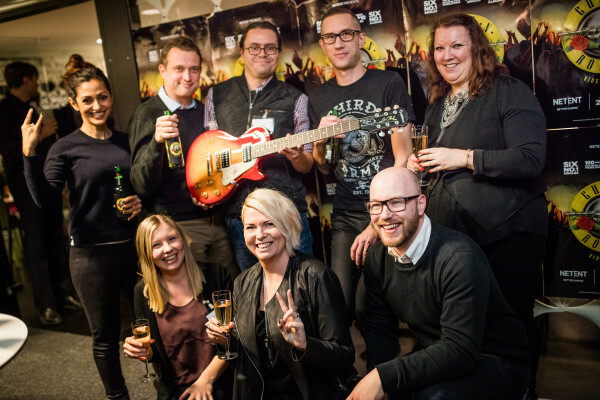 Scores of NetEnt customers were invited to submit their most creative marketing campaigns, banners and videos in hope of winning the guitar signed by Guns N’ Roses legends Slash and Axl Rose that was presented last year during NetEnt’s game unveiling at ICE . The submission that got the crowd jumping most would be rewarded the highly-sought after prize. PAF Casino Team were picked from a list of almost 100 participating operators and were on hand at NetEnt’s offices on February 25th to pick up the signed guitar.